Today's Draw: Knight of Masts from Beth Seilonen's Fishy Tarot in the Resolution position from the Deck of 1000 Spreads. Do you have a passion for life? What is your life's mission statement? And are you in alignment with it? The Knight of Masts is a crusader for passion and that which lights a fire in your belly. He may not always get there quickly....he's riding a snail, after all. But he knows he will get there eventually because he is very goal oriented and never loses sight of what's important. Would that we could all say the same. In one of the books/ebooks I plan to write, Spiritual Self Employment, one of the things I advise self employed people to do is to write a mission statement of what they want to get out of their job. For copywriting, mine includes the idea of writing on a variety of topics that challenge my skill, strategic knowledge and creativity. And also to do it for people who appreciate my effort. There have been a couple of times over the past 15 years when I've needed to revisit that mission statement in order to make tough, but healthy changes in my client list. What held me back is that, at times, the clients I was considering walking away from were my biggest ones. Having that mission statement helped, because it says nothing about money and everything about the things that make me happy. All of a sudden, a tough decision becomes simple. Mission statements keep you focused. 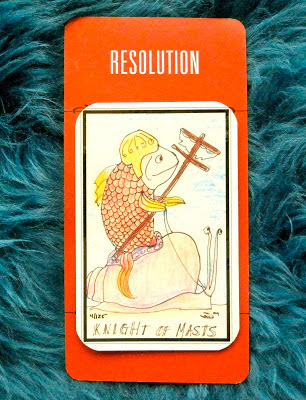 So the Knight of Masts in the position of Resolution is telling us that one of the questions we should ask ourselves when we're struggling over a decision is, "Does this support my passion for life?" The way to resolve any problem is really to hold it up to that question. And because "resolution" has a double meaning, we should resolve to pursue only that which fuels our happiness and passion for life. • Does it support my comfortable survival? You need water, shelter, food, general health and wellbeing to survive comfortably. If you're short on any one of those things, your focus on the pursuit of passion in your life will be challenged. So by comfortable, I don't mean material comfort in the sense of living plush. I mean the mental and physical ease that comes from having enough to survive. • Does is support something I'm passionate about? Lots of people have less than fabulous jobs. But if that job is bankrolling top-of-the-line scrapbooking supplies so you can spend time every day or every week scrapbooking your heart out, then it supports something you're passionate about. If you work too many hours to ever enjoy a minute of scrapbooking, then you need to question why you continue do it. A lesser paying job may give you the time you need to pursue your passion. This isn't just about your job, though. When you consider your relationships, commitments and other obligations in life, hold them to this test. And if you hate your career but it supports your passion, stop looking it from the angle of how much you hate it. Look at it from the position of how much it allows you to do. Your thoughts are also subject to this question. If your thoughts don't support your passion for life, then they need to change. • Do I do it out of love? Sometimes we do things we're not passionate about and don't support our survival. Speaking to your daughter's class on career day is one of them. Going to Open Mike Night to watch your husband play the same song you've been hearing all week is another. Picketing a local chicken farmer to promote animal rights is another. And, frankly, doing things like working out and eating tofu is another. There are things you do out of love—for someone dear to you, for a cause close to your heart or for yourself. Those things also fuel your passion for life. If you're doing something just because you have to—or if you act obligated even though it's serving a passion—you're not doing anyone any favors. One of my passions is something I talk about a lot on this blog. It's about living consciously and responsibly. And what I mean by that is, ask yourself questions. Don't just keep doing something because you did it yesterday. Ask yourself if it's still relevant. Ask yourself if it serves you. Things that are on the way out of relevance in your life will show their face because they will become painful to continue doing. And many of us will continue to do them anyway. If it doesn't fill the three criteria outlined above, it's time for a change. And the second part is to live responsibly. Say you've agreed to a career in accounting. And it's not a passion of yours, but it keeps you in kibble and after-hours pursuits, don't whine about it. Refocus and see how it IS serving your passion. And if you choose not to use the financial and time resources it offers you, that's your fault. Not the career's. Everything in your life is there because either a) you put it there or b) you choose to keep it there. Everything that's missing in your life is missing because of you, too. So if you're missing something in your life, put the energy that you spend bemoaning its absence into making it real. If you're not happy with something you do have your life, put it to the three questions. If you answer yes to any of them, then take responsibility for the purpose it serves and give it the energy and appreciation it deserves. If you answer no to all three, then take responsibility for that and make a change. If you're not doing it for survival, passion or love, why continue to waste your time?